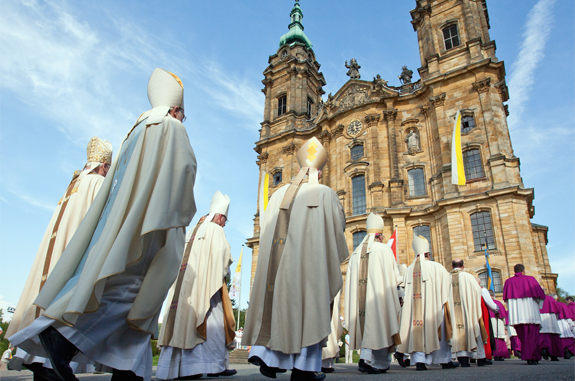 The controversy surrounding the gender flyer of the German Bishops Conference is symptomatic of the situation of the Catholic Church in Germany. We are experiencing in our days a frightening decline of the Catholic Church in Germany. So many people have left the German Particular Church that it urgently needs to stop and reflect; an evaluation of the situation by the bishops is indispensable. The frightening thing about the whole development is that now the older generation is leaving in great numbers—the very Catholics who supposedly still benefited from catechetical religious instruction according to the doctrine of the Church. Besides the massive exodus of lay people, an especially alarming sign is the fact that many priests are abandoning their ministry, fleeing to foreign countries or retreating into niche positions, because they want to get away from the stress of the unholy diocesan bureaucracy with its oddly non-ecclesiastical business. In this regard the oldest German Diocese, Trier, stands out especially; it seems not to care at all about its priests, and consequently much too little about its congregations. A flyer has just been published by the German Bishops Conference, that is, by its Secretariat with the “professionals” enlisted by it, entitled “Sensitive to the Sexes: A Catholic Interpretation of Gender”. And in it views are championed that contradict all the statements by the Pope, the cardinals, the recently concluded Roman Synod and in particular a declaration of the German-speaking group of Synod Fathers. The controversy surrounding this flyer is symptomatic of the situation of the German Particular Church, as it has developed in recent decades, as we intend to show in the following remarks. Even this very clear statement seems to fall on deaf ears in the Secretariat of the German Bishops Conference. Now one might object that the flyer had been prepared before this joint declaration in which the President of the German Bishops Conference and Archbishop Koch, who heads the Committee on the Family, participated. But then the flyer should have been withdrawn from circulation and pulped over the next few days. We do not think that that will happen, because here again the biggest problem of the Catholic Church in Germany becomes visible, a problem that exists nowhere else in the Universal Church: namely the power of the ecclesiastical bureaucracy (chancery staffs) that has expanded beyond all bounds in recent decades, and of the committees which, because of the deliberate omission of catechesis for decades, now scarcely have any knowledge of the faith, as the director of the chancery staff of one of the largest German dioceses assured me. He said that they ought to fire 70% of the staff there, because they no longer have anything to do with Christianity. The great Archdiocese of Munich and Freising in 1960, at the death of Cardinal Wendel, had 45 employees and three nuns as their chancery staff. Today there are approximately 1,000 (one thousand, sic!). And of course they have to keep busy. That is possible only in our local Church, which is super-fueled by our church taxes. Nowhere else in the Universal Church is there anything like it. By now these bureaucracies and committees have so much power that they hold most bishops in the palm of their hand. But only the bishops can change this. And we have seen, in the fates of Bishops Mixa and Tebartz van-Elst [whose resignations were extorted based on trumped-up charges of non-sexual child abuse and financial mismanagement, respectively –Translator’s Note], how dangerous it is for bishops to rebel against this power; the latter prelate works today at the Vatican in an important position for the Universal Church. In Germany a parallel church has been formed out of this ecclesiastical bureaucracy, along with the committees, the institutions and the extensive cliques of theologians ensconced at the state universities, and here in our country it wields the “power” to a great extent. This is especially true too of the Secretariat of the German Bishops Conference, which is responsible for the flyer, and especially for the KNA (Katholische Nachrichtenagentur, German-language “Catholic News Agency”), and also of the Central Committee of German Catholics (ZdK) and the official Catholic press and internet presence. 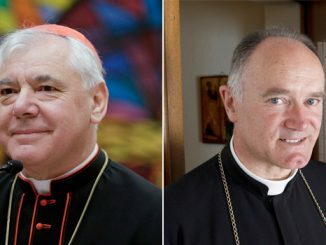 One Vatican prelate told me three years ago that the supersized Secretariat of the [German] Bishops Conference piles so much documentation on the bishops that they alone would be overburdened by it; well somehow these people have to keep busy. Is all this now too bleak a view of the situation? One of the most famous Vaticanists, the utterly liberal John L. Allen, in his exhaustive 500-page book, The FutureChurch: How Ten Trends are Revolutionizing the Catholic Church, thoroughly and conclusively depicted for our particular Church and others of the Northern Hemisphere the decline that we are experiencing, and he named and described the “parallel church” that we mentioned. He foretold the decline of what we have designated here as the “parallel church”. Through our prayers and support of the bishops, let us help to make the parallel church disappear as fast as possible, so that the Church in our country will really listen now for a change to the whole message of this Pope Francis, at least, and energetically accomplish the detachment from worldly things [Entweltlichung] that he calls for almost every day with practical examples. May we be assisted in these efforts, under the leadership of the Mother of God, by the Patron Saint of Germans, the prince of the heavenly hosts Saint Michael, by Saint Boniface and by all our great saints through the power of their intercession. Dr. Michael Schneider-Flagmeyer is a founding member of the Forum of German Catholics.